Restoring data with their own hands, the program Fomsoft Disk Analyzer 103, the selection and analysis of the disk. 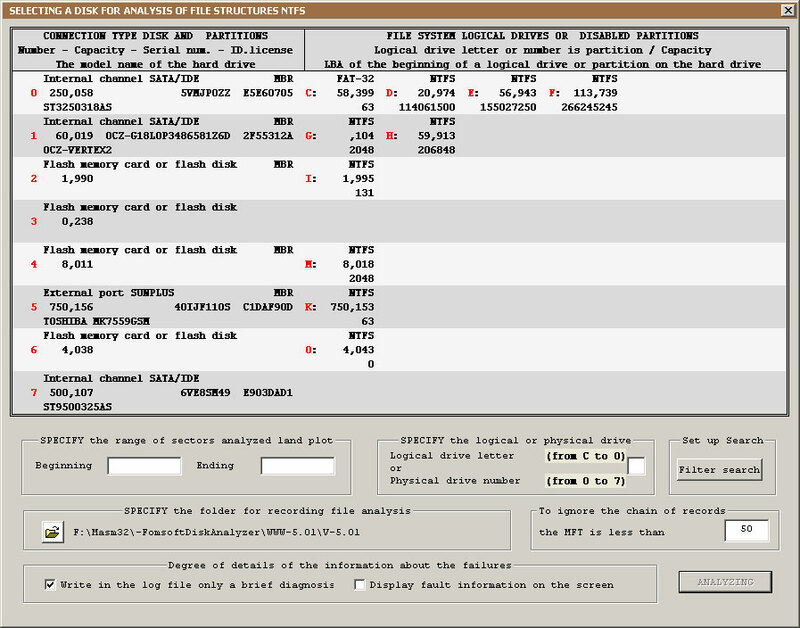 select the disk for analysis. After selecting the main menu item, the program displays a list of disk devices and their parameters. Fig. 6. Window select the disc for analyzing file structures. In this window, you can specify the directory to write files analysis files. To perform validation on the physical disks it is necessary to enter its number on the diagram represent the numbers from 0 to 7. If you want to analyze the logical drive, you can enter its letter. After selecting the disk, the program calculates the addresses of the beginning and end of the analyzed station. The user can change these settings at their discretion, by setting consistent values. In the formation of the file FomsoftDiskAnalyzerSTRING.txt containing chain fragments of the master file table (MFT), sets the minimum size of the chain of records in FILE Record. If there is a chain of less than the set value, it is ignored. This parameter is relevant for disks that are running Windows 10 operating system as its file system creates additional chain records FILE Record that is a duplicate of the main table record MFT. Dialog by clicking the button "Filter search" can view the settings selection of the file on which information is placed in the analytical file FomsoftDiskAnalyzerUSER.txt.